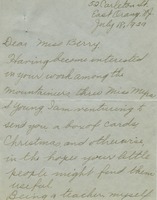 Miss Reynolds thanks Miss Berry for the hand-made candies at Christmas time and sends a small gift to the Berry Schools. 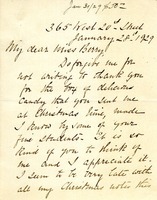 Miss Pierrepont writes to thank Miss Berry for the homemade candy and to wish her the best for the new year. 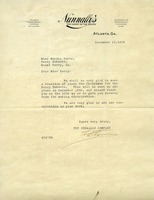 The Nunnally Company sends the Berry Schools 100 pounds of candy for their Christmas celebration. 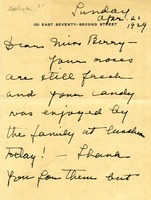 Harrison thanks Berry for the candy she sent. 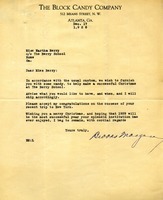 Eagan thanks Berry for the Christmas candy and message, and hopes to visit in 1929. 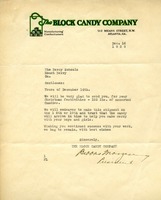 The Block Candy Company furnished the Berry School with candy to make a successful Christmas. 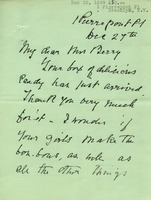 Behm sends thanks for the Christmas candy and assures Berry of his continued support. 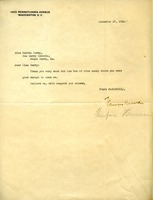 Eugene Stetson thanked Martha Berry for sending him Christmas candy with a card. 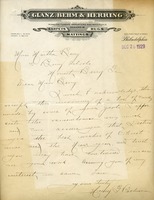 He comments that it reminds him of his boyhood spent in Georgia and delicious home-made candy served then. 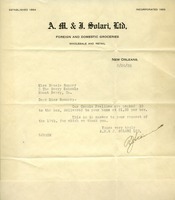 A. M. & J. Solari Ltd. responds to an inquiry from Miss Bonner about Creole Pralines. 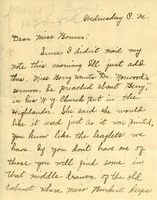 A. L. Norris writes to answer Miss Berry's letter to Frank E. Lowenstein about a donation of candy for Christmas. Norris Inc. will donate 50 pounds of candy.